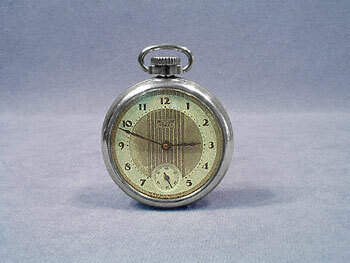 This is a Westclox Dax pocket watch. It has a two tone green face with vertical black stripes running down the middle, and a small dial for seconds at the 6 o'clock position. It is marked on the front with "WESTCLOX", "-DAX-", and "MADE IN U.S.A.". The watch has 1935 stamped inside the back along with multiple patent numbers and "Made in the U.S.A.". The fast/slow adjustment is also located inside the back. The face shows some fading in a couple of areas, which can be seen in the photo. The case is in excellent condition, and has only minor surface scuffing, as does the crystal. The watch is 2" in diameter, runs great and keeps accurate time.